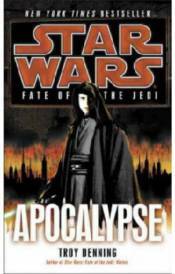 'NEW YORK TIMES 'BESTSELLER In the stunning finale of the epic Fate of the Jedi series, Jedi and Sith face off--with Coruscant as their battlefield. For the Sith, it's the chance to restore their dominance over the galaxy that forgot them for so long. For Abeloth, it's a giant step in her quest to conquer all life everywhere. For Luke Skywalker, it's a call to arms to eradicate the Sith and their monstrous new master once and for all. In a planetwide strike, teams of Jedi Knights take the Sith infiltrators by swift and lethal surprise. But victory against the cunning and savage Abeloth, and the terrifying endgame she has planned, is anything but certain. And as Luke, Ben, Han, Leia, Jaina, Jag, and their allies close in, the devastating truth about the dark side incarnate will be exposed--and send shock waves through the Jedi Order, the galaxy, and the Force itself. There can be no surrender. There will be no mercy. It's not just the future of the galaxy at stake. It's the destiny of the Force.